Ted N.C. Wilson makes a personal appeal during a visit to the president’s official residence. Responding to an appeal by the Seventh-day Adventist Church president to abolish Saturday exams, Uganda’s leader announced that he would take steps to accommodate the convictions of Adventist students — and also those of Sunday-keeping Christians and Muslims. Ugandan President Yoweri Museveni tweeted the announcement on Feb. 17, a day after hosting church leader Ted N.C. Wilson for an official visit-turned-Bible study at his state residence in Entebbe outside the capital, Kampala. Ugandan media interpreted Museveni’s remarks as a done deal. “President Museveni Agrees to Seventh-day Adventist Church’s Request to Cancel Saturday School Exams,” read a headline on the website of the NTV television channel. Two tweets by Ugandan President Yoweri Museveni. The bottom photo shows Ted Wilson handing a leather Bible to the president. Local Adventist Church leaders applauded the surprise development. “This is exciting! Many people have suffered,” said Daniel Matte, president of the Adventist Church in Uganda, whose own son had to repeat a three-year state university course in agriculture after exams fell on Saturday. Museveni, wearing a green military uniform and black boots, set aside the formality that usually dominates visits with foreign guests to warmly welcome Wilson; his wife, Nancy; Matte; Ruguri; and a delegation of leaders from other countries of the East-Central Africa Division on Feb. 16. Smiling and joking, the 73-year-old president greeted each member of the delegation and asked where they were from. He addressed many attendees in their own languages. Immediately, Museveni asked about the origins of the Adventist Church, and Wilson offered a short history lesson, starting with the Protestant Reformation. 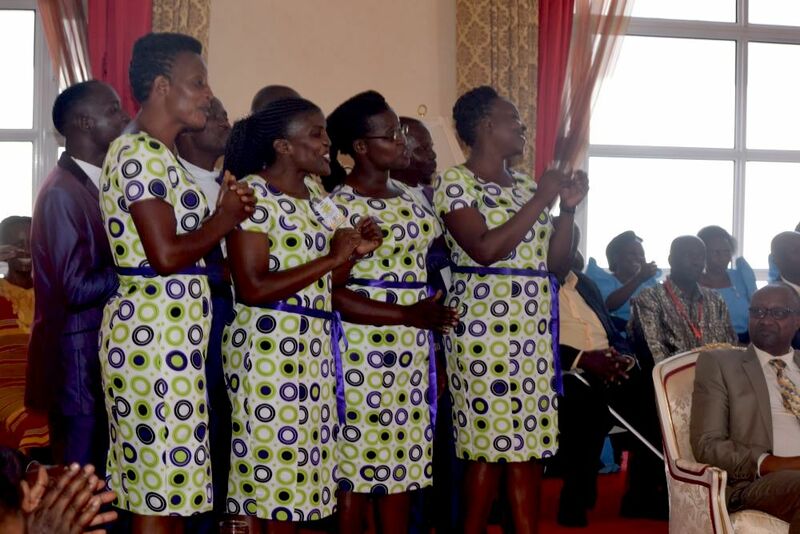 Museveni seized on the fact that Adventists observe the Sabbath on Saturday, unlike other denominations that emerged from the Reformation, and inquired about “the mathematics” of counting the days of the week. Praising the question, Wilson said Saturday has long been understood to be the seventh day and only more recently have some people started viewing Sunday as the seventh day. Museveni pressed for more information. Wilson spoke about God blessing the seventh day at the end of Creation week in Genesis 2:2-3 and said Jesus kept the seventh-day Sabbath. 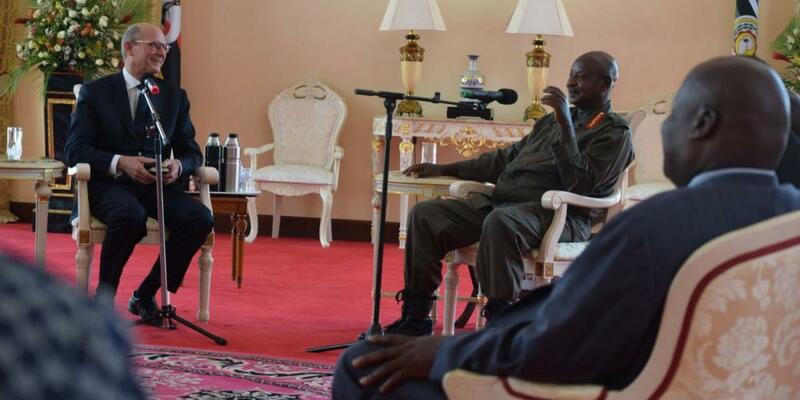 He encouraged Museveni to study the issue further. The conversation shifted to the church’s work in Uganda, and Wilson expressed gratitude for the government’s support of religious freedom. After that, he made a personal appeal for Adventist students to be allowed to reschedule Saturday exams at public schools. Wilson, speaking in an interview, said he looked forward to the time when thousands of Adventists students in Uganda won’t be forced to choose every year between passing exams or obeying the Fourth Commandment to “remember the Sabbath day to keep it holy” in Exodus 20:8. Also at the meeting, Wilson asked whether he could share a formula for leadership success from the Bible. When Museveni agreed, Wilson opened a small black Bible and read Micah 6:8: “He has shown you, O man, what is good; and what does the Lord require of you but to do justly, to love mercy, and to walk humbly with your God?” (NKJV). Then Wilson offered a gift of a pen engraved with the name and emblem of the Seventh-day Adventist Church. He suggested that Museveni could use the pen to sign important documents or, more important, to underline verses in the Bible. 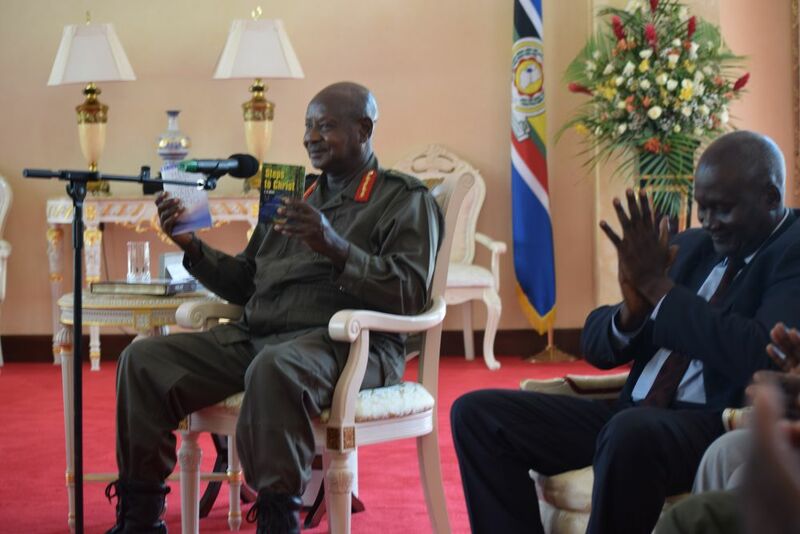 Wilson also presented Museveni with a leather Bible, Ellen White’s “Steps to Christ,” and the pamphlet “Help in Daily Living,” which contains key chapters from White’s book “Ministry of Healing.” He encouraged the president to read “Steps to Christ,” saying the book’s 13 chapters could be read easily in a single afternoon or between engagements. The choir sang two more Christian songs, ending with a heartfelt rendition of “It Is Well With My Soul” in Luganda. The visibly moved president inquired about the meaning of the words. Wilson told the history of the song — it was written by U.S. lawyer Horatio Gates Spafford after his four children perished in an ocean storm in 1873 — and explained that “it is well with my soul” meant finding consolation in Jesus amid the storms of life. Attendees described the one-hour meeting as a unique worship service that broke usual protocol by substituting political speeches for friendly, spiritual conversation. Wilson pointed out that Museveni is familiar with the Adventist Church. As a child, Museveni learned to read at an Adventist grade school in the town of Kyamate — an autobiographical footnote that he emphasized both at the meeting and during a brief speech to thousands of people attending a Sabbath worship service led by Wilson at Kampala’s Kololo Independence Grounds on Feb. 17. Museveni also has donated funds to Adventist projects, including a community center in the western town of Kasese, and he has spoken with admiration about Adventist efforts to improve the wellbeing of their communities. February 17 - Part Of A Mighty Movement Total Member involvement can be done by anyone, anywhere. Join us as we visit Maryland, USA to watch one example of TMI. New Wellness Center Declared a Miracle in India Adventist Church president Ted Wilson praises the Adventist Mission-funded project as an example for others. Religious Freedom The vital importance of religious liberty around the world, mission in Vietnam, and in an unnamed country. He’s No Pastor​ in Uruguay. He’s Simply ‘Carlos’ Adventist Church leader Ted N.C. Wilson encourages church members in a promising mission field. Paraguay’s Vice President Takes Bible Verse to Heart Adventist Church leader Ted N.C. Wilson gives him an impromptu Bible study with an Andrews Study Bible. He Saw This City Some stories need to be told. Watch the testimonies of an unidentified man working in the middle east. The Family on the Run We'll follow a Rohingya refugee in Bangladesh to see how she escaped a difficult situation. Her new home poses new challenges, but ADRA is there to help. Blind Church Reaching India’s New Middle Class India has become one of the global leaders in technology. With their new wealth, many of these young people are asking questions about life’s purpose and meaning. A Pioneer Life for Me A Global Mission pioneer in Botswana tells his story.